Having missing teeth can make it hard to eat, speak, and swallow. What’s more, missing teeth can affect a person’s self-esteem, making them feel self-conscious whenever they smile. Luckily, dental implants are the perfect solution for when someone has a gap in their grin. Dr. Hanna Mansoor is an expert at placing these implants to provide Gilbert area patients with the picture-perfect teeth they’ve always dreamed of. Dental implants are a permanent solution to missing teeth. They involve surgically placing a titanium screw inside a patient’s jawbone. Over time, the jawbone grows around this metal post, securing it in place much like a natural tooth root. Once healing is complete, a replacement tooth can be mounted onto the post, taking the place of the lost tooth. Endosteal implants, which are individual posts placed directly in the jawbone. After the jaw heals around these posts, patients require a second procedure for the placement of an abutment. Finally, the replacement tooth is attached to the abutment. Each implant will replace the missing tooth and acts as a tooth root. The other type is called the all on 4 dental implants which will replace the entire arch with 4-6 implants and has a bridge that connects the teeth together and allow for 95% chewing capacity. Patients can receive just one dental implant to fix a single missing tooth or a whole mouth of implants to fix several missing teeth. It all depends on their unique situation. 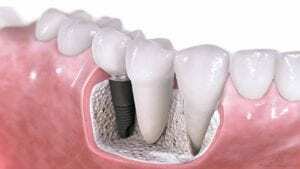 Dental implants have numerous benefits over other methods of tooth replacement. In fact, most dentists consider implants the gold standard of replacing teeth simply because there is no better option. Dental implants offer a more stable fit than dentures or bridges, which can slip and loosen over time. Because implants are rooted in the jaw, they always stay secure. Dental implants can last for decades, providing many patients with a lifetime solution to missing teeth. Bridges, on the other hand, only last for an average of five to 10 years. Because implants help stimulate the jawbone, it degrades less, helping the patient maintain their normal profile. Patients who wear dentures, on the other hand, do not have this kind of stimulation, which can result in a saggy jaw and other visual deformities. With missing teeth, patients probably resort to a soft foods diet because they are unable to chew. Even dentures limit the types of foods patients can eat, especially if they don’t fit well. Dental implants eliminate these issues by allowing patients to eat whatever they want. Missing teeth and ill-fitting dentures can result in lisps and other mispronunciations. Once teeth have been restored to the jaw, Gilbert patients will find they have a much easier time annunciating clearly and precisely. Having missing teeth definitely puts a damper on anyone’s smile, but dental implants can solve this for good. No longer will patients have to hide behind a closed-mouth smirk; rather, they can laugh fully because they feel confident in their appearance. To find out if you would benefit from a dental implant procedure, call our Gilbert, AZ dental office today! During the implant procedure, Dr. Mansoor will take every precaution to ensure the patient experience is as smooth and pain-free as possible. The procedure will happen in her Gilbert office, and she will begin by sedating the patient so that they don’t feel a thing. Next, she will make a slit in the gums where the implant will be inserted. This is generally right at the site of the missing tooth unless a patient is having an implant-supported bridge placed, in which case it might be centered in the middle of the toothless gap. Then, she will carefully use a drill to make room for the implant in the bone. Once the implant fits, she will screw it into place so that it securely rests in the bone. With the implant in place, all that is left to do is stitch the gum tissue closed to promote healing. Complete healing may take a few months as the bone absorbs the implant. After this stage is complete, patients will require a smaller procedure to place the abutment on the implant screw. This is the part that holds the replacement tooth, which can then be installed after Dr. Mansoor has designed the perfect crown. There is no reason for Gilbert patients to continue suffering from all the issues that accompany missing teeth. Dental implants are a safe and effective solution to tooth loss, allowing patients to eat, speak, and smile normally for many years to come. Are you suffering from missing teeth in the Gilbert area? Call Smiles By Hanna today at (480) 279-3700 to schedule your initial dental implant consultation and don’t forget to ask about Smiles for Veterans implant program.